Somewhere in the course of his life, Louisville industrialist and philanthropist H. Charles Grawemeyer developed the idea of a series of awards that would pay homage to creativity and genius in areas of human endeavor too much ignored by other awards. At the same time he wanted to bring recognition to two institutions he considered pivotal in his life — the University of Louisville, where he received an excellent education through the Speed Scientific School during the Great Depression, and the Louisville Presbyterian Theological Seminary, on whose board he served for many years. The results are the Grawemeyer Awards in Music, Political Science, Education, Religion, and Psychology — a set of distinctions meant to, in Grawemeyer's words, "help make the world a better place." The Power of Ideas, Volume II continues where the first volume left off. While Volume I chronicled the first fifteen years of the award ending with the 1997 awards, this volume continues forward with an additional ten years of awards, ending with the year 2007. "It's important for Kentuckiana folks to know that an unassuming and altruistic Louisville businessman, H. Charles ('Charlie') Grawemeyer, and an innovative and influential educational institution, the University of Louisville, are responsible for a remarkable annual awards program for recipients in the fields of music, political science, education, religion and psychology. It's a fact that the U of L Grawemeyer Awards Program, which The New Yorker recently recognized for its 'gold standard' stature, grants the city international renown and should garner even greater pride for area residents. 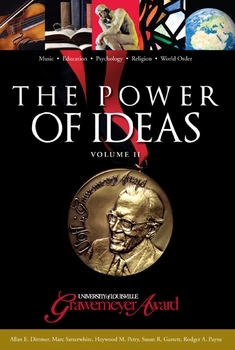 "Volume II of The Power of Ideas, edited by Allen E. Dittmer, Marc Satterwhite, Heywood M. Petry, Susan R. Garrett, and Rodger A. Payne, continues the text of Volume I by chronicling the awards' history and the recipients' winning ideas and achievements from 1997 through 2007 and by including reflections on Grawemeyer by his daughters and grandchildren. "The second volume of The Power of Ideas shows how the power of Grawemeyer's commitment to culture and community, like the strength of his award recipients' intellect and creativity, continues to positively reconfigure the world."